President-elect Donald Trump will soon have to focus seriously on nuclear policy. 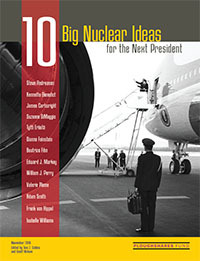 Our new report, "10 Big Nuclear Ideas for the Next President" was released at an event which included a very informative panel discussion, which you can watch above. In the video the moderator is Valerie Plame, former career covert CIA operations officer and best-selling author, and the panelists are: Ellen Tauscher, former US Under Secretary for Arms Control and International Security; Kennette Benedict, senior adviser to the Bulletin of the Atomic Scientists and lecturer at the University of Chicago Harris School of Public Policy; and Suzanne DiMaggio, senior fellow at New America, where she directs a long-running US-Iran policy dialogue and a recently launched US-North Korea Track 2 Dialogue. You can also watch a video of the whole event's livestream on Facebook, recorded November 16, 2016  to learn more. Despite diverse backgrounds and perspectives, the contributors agreed on one basic point: current nuclear policy is not working. Fresh ideas and major course corrections are needed. Don’t hand Russia a veto over US policy. If Moscow continues to oppose cooperation on arms control, Washington can reduce its nuclear forces independently, as President George H.W. Bush did. In the new report, Secretary Perry argues that, "our levels of nuclear forces should be determined by what we need, not by a misguided desire to match Moscow missile for missile." Don’t waste money on unneeded nukes. Downsize President Obama’s unsustainable, trillion-dollar plans to rebuild the nuclear force. For example, Trump could phase out intercontinental ballistic missiles, as proposed by Perry, and cancel the new air-launched cruise missile, as proposed by Sen. Feinstein and Rep. Smith. Fix North Korea, don’t unfix Iran. Despite statements against the Iran deal during the campaign, Trump would be wise to support the successful agreement once in office and use it as a model for reaching out to North Korea, which continues its dangerous march to develop smaller weapons and larger missiles. Suzanne DiMaggio, senior fellow at New America, argues that, "diplomacy in the absence of trust is hard, but it’s not impossible." Disconnect the nuclear button. No one human being should have the ability to launch hundreds of nuclear weapons in about four minutes with no checks and balances by Congress or anyone else, argues Dr. Kennette Benedict. Trump won despite the fact that many voters do not trust him to be commander-in-chief of US nuclear forces. He could allay fears by working to expand decision time and get congressional leaders in the loop before any president can decide to go nuclear. Please read these 10 extraordinary essays  to find out more about how we can shape a safer future for us all.